Alara was a King who is generally regarded as the founder of the dynasty that created the Kingdom of Kush. His successors colonized and ruled Egypt as the 25th Dynasty. He was the first recorded king of Nubia after the collapse of Kerma civilization. He is a central figure in the mythical origin of the kingdom of Kush, a legend that has been decorated over time with new elements. He was more associated with Upper Nubia from old Meroë to the Fourth Cataract rather than with Kerma. His two immediate successors, Kashta and Piye, ruled Egypt. Nubian literature credits Alara with a substantial reign since future Nubian kings requested that they might enjoy a reign as long as Alara’s. Despite Alara was a deeply revered figure in Kushite culture there are no much confirmed information about his origin, family and his reign. This strange fact raises a lot of suspicion about his origin and the motives of Kush Kingdom. Kush was established after the Bronze Age collapse (1177 BC) and the disintegration of the New Kingdom of Egypt. Kush was centered at Napata during its early phase. King Kashta invaded Egypt in the 8th century BC and Kush ruled as the Twenty-fifth dynasty of Egypt for a century, until they were expelled by the Assyrians under the rule of Esarhaddon. The name Kush has no origin in the Nubian history or language, and early Egyptian records didn’t mention it. The name Kush, since at least the time of Josephus, has been connected with the biblical character Cush, in the Hebrew Bible. The Nubian region had gone by other names in the Old Kingdom. Since the arrival of Israelite from Yemen into Abyssinia and south of Kerma from 1870 BC the term Kush became used to point to hostile people and territory. Tuthmosis I made several campaigns c.1504 BC south resulted in protecting Kerma and making the 4th Cataract as a border line. Kerma culture increasingly maintained strong relationships with Egypt while hostility with the south continued for 220 years till c.1300 BC. During the New Kingdom, Kerma nevertheless became a key partner – economically, politically and spiritually. Indeed, major ceremonies were held at Jebel Barkal near Napata, and the royal lineages of the two regions seem to have intermarried. The extent of cultural/political continuity between the Kingdom of Kerma and the Kingdom of Kush is difficult to determine. Threats to the early Egyptian Eighteenth Dynasty and Kerma were evidenced in the writings of Ahmose, an Egyptian warrior who served under Ahmose (1539-1514 BC), Amenhotep I (1514-1493 BC) and Thutmose I (1493-1481 BC). At the end of the Second Intermediate Period (mid sixteenth century BC), Egypt faced the twin existential threats -the Turkic Mongolian Hyksos in the North and the Yemeni Israelite in Kerma to the South. Late Kerma – (c.1500–1100? BC) (expulsion of Israelite and Egyptian New Kingdom protection). Due to the widespread looting and slavery by the Israelites during the turbulent time of Classical Kerma from 1750 BC and until the liberation of Karma with the help of Egypt in 1523 BC, there is a strong possibility that the Alara might be one of their remnants or of the descendants of the Israelites or of their liberated slaves. Perhaps the neglect for the great Karma civilization was caused by the fact that the Kush Kingdom was not native and authentic and it was ruled by foreign rulers contrary to the civilization and the kings of Kerma. Kerma is one of the oldest historical cities where archaeologists have proven that this city is more than 9,500 years old. Its Nubian name is Doki, which means the Red Hill till today in modern Nubian. The capital was located in the northern state of Sudan on the east bank of the Nile River and about 700 kilometers south of the city of Aswan. The area of ​​Karma was the center of the civilization of Kerma since 2500 BC and for 1500 years and is one of the most important centers of ancient human civilization. It grew with time and a kingdom of great importance and strong contact with the state of Kmet (ancient Egypt) was established. It was ruled by families and priests of mixed Kerma and Kmet origins. The ties between Kerma and Egypt were not of two states but could be considered different regions in one state. When the Kingdom of Kerma was invaded, colonized and looted by the Yemeni Israelite who came through Abyssinia since 1870 BC, the kings of Egypt defended Kerma and expelled the Israelites in 1523 BC by Ahmose I. Kerma remained under the protection of the Egyptians for many centuries and life flourished again until 1000 BC. Napata was an old Nubian city. Thutmosis III fortified it and developed it in 1450 BC to defend Nubia and make it as a border that foreigners cannot pass northward. In 780 BC the Kushites chose Napata as a capital of the Kingdom of Kush and then moved the capital to the ancient Meroë, north of Shendi, in 591 BC. Also found in the city of Kerma on a large building built of bricks, called today, “West Dabofa.” The scientists differ in determining the function of this huge edifice, which is about 19 meters high, and they are happy that it was either a palace or a temple. 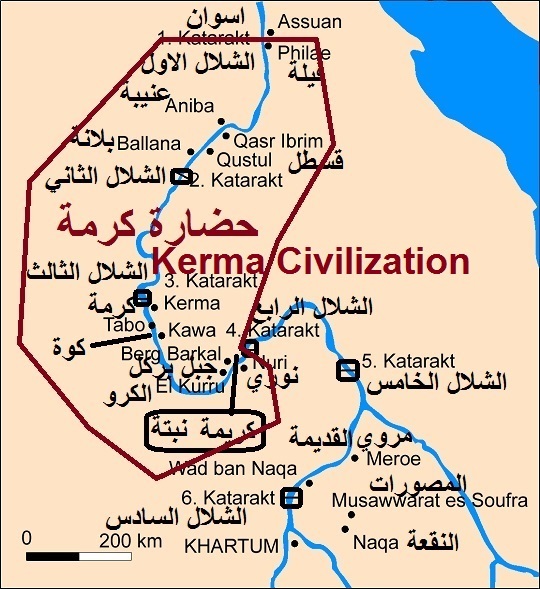 The civilization of Kerma was characterized by many aspects, the most important of which was the creation of the meeting of kings in the masses, which found no resemblance to it in Egyptian civilization or any civilization Other. It was also characterized by a special kind of pottery. More than 10 of these dawns have been found in Kerma, and they have always been known as the primary capital of human existence in Sudan and one of the oldest African civilizations. Around 1800 BC, in Iran, Assyria, the Levant and the north of the Arabian Peninsula, there were very dangerous looting groups of Turkic nomads coming from Mongolia and using horses, which were unknown to the inhabitants of those areas. In the south of the Arabian Peninsula in 1870, drought and famine led to the migration of the Arab tribe of Israel from their homeland in Yemen to Abyssinia via Bab-al-Mandab. While the Turkic Mongolians were plundering the Levant, the Bedouin Arabs of Israel were plundering Abyssinia and Kerma. The flow and looting of the Turkic Mongolians increased and they occupied northern Egypt in 1630 BC. First they were known as YHWH Shasu (nomadic Jews), then became known as the Hyksos (Heka-Shasu, nomadic rulers). Collusion between the Israelites who were in the south at Kerma and the Hyksos occupiers of the Delta of Egypt was established. King Ahmose I came from an Egyptian Nubian mixed family and liberated both the Delta in the north and Kerma in the south in 1523 BC after introducing the use of the horse in his armies. In 1446 BC, one of the kings of Abyssinia expelled the Israelite, but many of them had long penetrated the regions of Kerma and the rest of Sudan and continued to practice looting and slavery even after the expulsion of their brothers from Abyssinia. 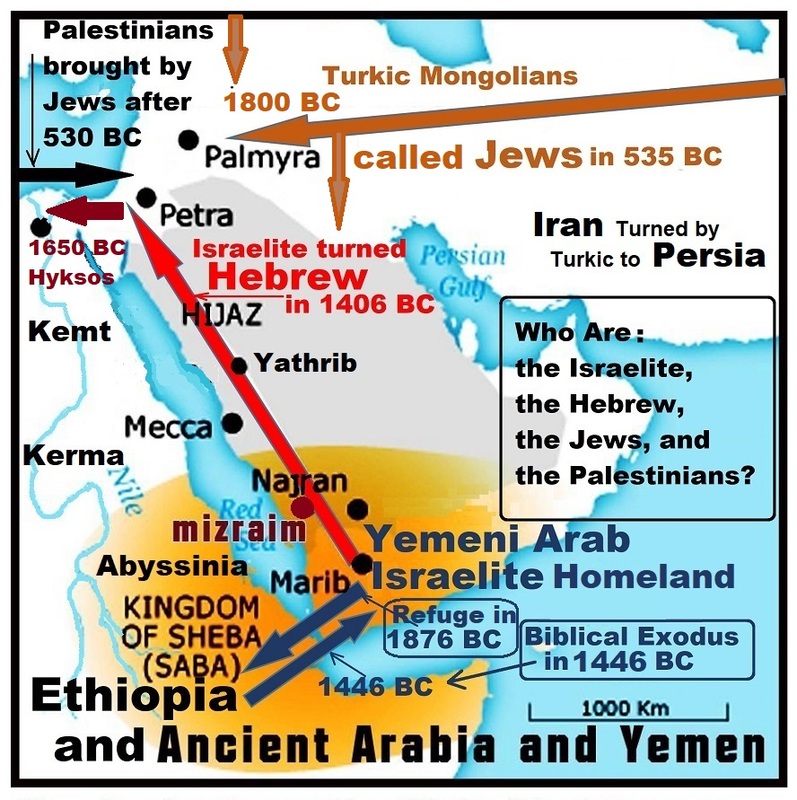 After the return of the Israelites to Yemen by crossing Bab-al-Mandab they moved north towards Canaan to meet their allies of the Turkic Mongolian gangs (Hyksos) who were expelled from Egypt and continued to loot the Levant and the north of the Arabian Peninsula. In 1406, the Israelites invaded Canaan and established the colony of the tribes of Israel with the help of the Mongols. In return, they helped them in the conquest of Assyria in 1392 BC. Other groups of Turkic Mongolians were also active in looting the Caucasus, Eastern Europe and Anatolia since 1800 BC and their dangerous sabotage operations escalated with the use of horses and very bloody methods until they destroyed the civilizations of the Hittites and other peoples in the region. The year 1177 BC was the year of great catastrophe for all peoples on the Mediterranean Sea, where many countries and civilizations collapsed and destroyed and cities burned and entire peoples killed and displaced. As a result of these massacres and great destruction, the spread of chaos and the escape of very large groups in all directions in what is known as the phenomenon of the peoples of the sea and Bronze Age Collapse. These events broke the backbone of the ancient Egyptian and Nubian civilizations, and the whole region and triggered a rapid collapse. Egypt lost its prosperity and independence by the fall of the Twentieth Dynasty in 1077 BC to invaders from all over the world. These negatively affected the independence, freedom and civilization of Nubia. Then, after 4 centuries, the 26th Dynasty (664 – 525 BC) appeared in Egypt. It was the last native Egyptian dynasty to rule Egypt and it was overthrown by the Persian invasion in 525 BC. The 26th Dynasty considered the Kushites as enemies as a result of their cooperation with the Persians; and their execution of the Egyptian King Necho I, the father of King Psamtik I by the Kushite King Tantamani. According to Herodotus, the Kushites did not pay tribute to Persia. Instead they sent precious gifts to the Persian king, including gold, ebony and elephant tusks. We also know from Herodotus, as well as from other Greek reporters, that part of the Persian army of King Xerxes (486-465 BC) was composed of Kushite archers (Herodotus vii.69-70). So we can say with reasonable conviction that the Kingdom of Kush was never like Kerma, but it is more likely that Kush and the Kushites were foreign and foreigners and they were not free natives. These facts raise a very essential question: Was the Kingdom of Kush a creation and an agent for the Arab Israelite and for the Turkic Mongolian Persian Jews?